Product Consists: Basket Arrangement of 12 Red Roses in between 10 bars of Cadbury Dairy Milk Chocolate (Weight: 12.5 gm), Four Fruit Juice Pack (Weight: 200 ml) along with 6 inch Teddy Bear. Express your love to your family and close friends with this appealing basket arrangement. 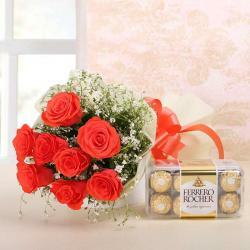 Teddy bears, chocolates, Juice with Roses arrangement will never lose their popularity in the heart of the people. Be it any occasion, you can present this lovely basket arrangement of teddy bears, Cadbury dairy milk chocolates, fruit juice and red roses arrange in basket for loved once. Make surprise your loved ones with a special gift hamper. 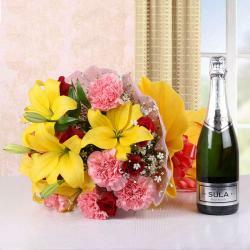 If their birthdays or any other occasions, you can present this hamper to show your love. It contains a cute teddy bear, red roses and Cadbury dairy milk chocolates in a cane basket. This is gift combo are best for making anyone feel instinctive aptitude. So go ahead and book your order now. You may also send Gifts to India to your near and dear ones through Giftacrossindia. Product Includes: Basket Arrangement of 12 Red Roses in between 10 bars of Cadbury Dairy Milk Chocolate (Weight: 12.5 gm), Four Fruit Juice Pack (Weight: 200 ml) along with 6 inch Teddy Bear.